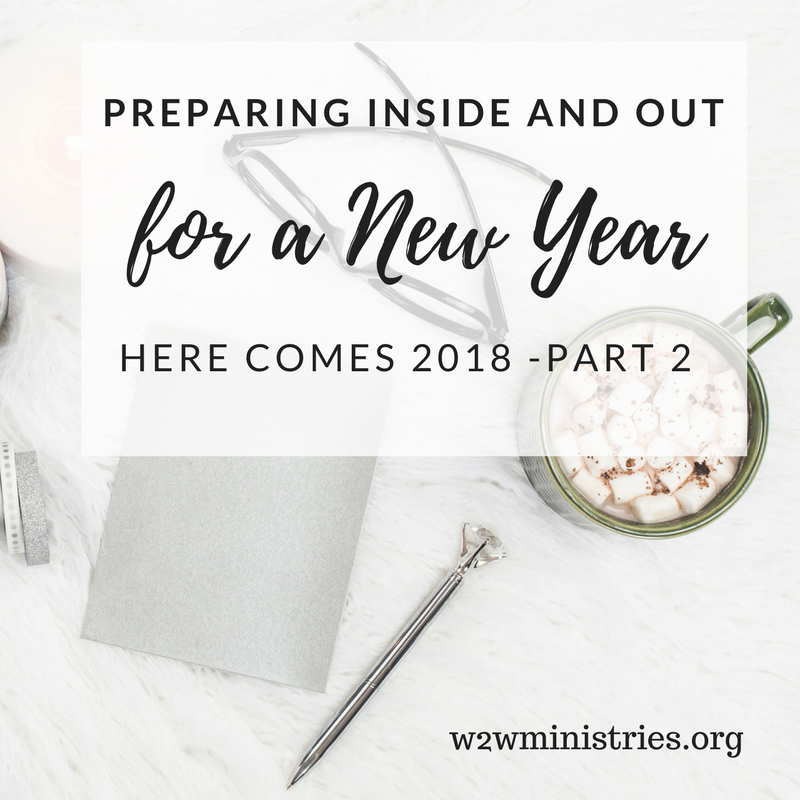 Preparing for a New Year requires not just preparation spiritually but also other areas of our life. Just as we talked last week (click here if you missed it!) 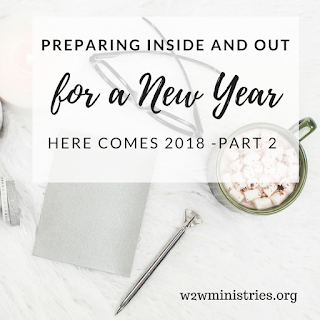 about decluttering our spiritual lives of things that take our eyes off Christ, and beginning to practice spiritual disciplines even now versus waiting for January. This week, I thought we could talk about preparing physically. The beginning of a New Year finds many of us making resolutions and setting goals. Many times, we fail quickly and decide to never set a resolution again. Sometimes though we last a bit longer, but honestly holding to resolutions for an entire year doesn’t seem to happen. So my challenge to you is that we need to start adopting the habits, we want to see in the next year, now! What things do we need to do physically? 1. Rest – for me this is the most difficult and yet most necessary. Once I’m worn down and exhausted I’m susceptible to illness and my family always suffers. Rest for me only happens when I’m intentional and plan ahead to get to bed on time except for the rare occasions I need to be up late. It means taking a few days occasionally to sleep past my normal 5am wake up. And sometimes it does mean taking several days to allow myself to sleep until I wake up. 2. Eat healthy – choosing to eat right is just that, a choice. Is it easy? No not at all. And lest you think that I have this figured out, I don’t. I struggle with this so much because honestly it’s just easier to eat junk most of the time. But we do have to continue to seek eat well because it is how we take care of ourselves. If we are to be around for the long term to take care of our families and to do what God has purposed for us to do then we have to do the best we can to care for the bodies we have. 3. Exercise – this one fits with #2 pretty closely I realize, but it needs to be said. Many physical and mental health problems can be traced to a lack of exercise. Even a daily walk is proven to help alleviate many symptoms! While it is difficult to find the time to devote to exercise, once again we have to realize that we only have one body, and we should care for ourselves so that we can care for the others – our families, our friends and even our churches. I hope this provoked some thoughts for you and encouraged you to make plans to care for yourselves the best that you can in the New Year. A fresh mind centered on Christ and a healthy body that can handle the busy lives we all lead can help us get started well. I have found that if I plan for a future date, there is always a reason for putting it off, even when it's set for New Years. To succeed at change in my life, I have to choose "today." Thanks for a thought provoking article. Thank you for commenting Val - I agree choosing today is so important no matter the "calendar day!" Great point that we should start NOW to make desired changes. Rather than focusing on presents at Christmas, why don't we focus on making our present the best that it can be? Rest is also the most difficult for me. It is hard for me to relax while my mental to do list is on an endless replay loop. Rest and taking care of ourselves should be a top priority. It is neither selfish nor lazy to do so. In fact, if we don't rest and take care of ourselves, we are less likely to be able to accomplish what we want to do. Even Jesus, who had a big to do list to accomplish on Earth (heal lepers, teach the masses, etc. ), took time to withdraw, rest and talk to God. You've just inspired me to go to bed early tonight and get some rest. Myto do list will still be there tomorrow Thanks for the reminder to take care of myself! I hope you are finding continued success in your intention to rest -it is so important and the hardest for me to do as well!